The boys soccer team faced a pretty daunting challenge on Friday when it traveled to the campus of the St. Pius X Golden Lions. The No. 1-ranked AAAA team in metro Atlanta according to The Atlanta Journal-Constitution, the Golden Lions are two-time defending AAA champions. Prior to facing the Knights, Pius had reeled off 13 consecutive victories by an aggregate score of 54-2. Among the 13 wins was an impressive 4-0 thrashing of St. Joseph’s, a reigning state soccer champion in South Carolina, in a showdown of southern state champions played at Clemson University. If all that wasn’t enough, it was Senior Night for the Golden Lions. Although the Knights worked hard and showed a lot of grit and determination, St. Pius shut them out, 3-0. Grady started the first half with the ball but was immediately pressured into a turnover by the Golden Lions. Two minutes into the half, senior Golden Lion forward Edmundo Robinson, who wears No. 10 on his jersey, rocketed a shot at freshman goalie Jack Hudson. The ball hit off the post and rebounded to another Pius player Austin Fane, whose shot went just wide of the net. At 34:57, Grady senior captain, Matthew Peterson went down and was taken off the field with an injury. Despite the loss of one of their captains, the Knights continued to compete well, but at 25:37 outside forward Louie Aponte threw the ball into Grady’s box, finding the head of Fane, whose back flick header went just over Hudson’s outstretched hands. Soon after the opening goal, Pius built momentum out of the back and released the ball to Robinson, a star forward who reportedly will be playing collegiate soccer next year at Queen’s University in Charlotte, N.C. Robinson took the ball straight to goal and scored to give the Golden Lions a two-goal lead. At 16:34, a ball played over the top of Grady’s defense landed right on Fane’s foot. Hudson made a brilliant save to close out the half with Grady still only down, 2-0. The second half started with Pius dominating possession. 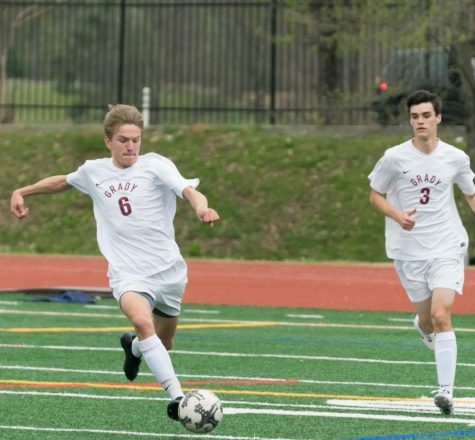 Grady fended off several Pius attacks and created chances of their own with shots by freshman midfielder Alex Durham and crosses into the box by junior outside midfielder Anders Russell. At 36:28, Peterson returned to the field. At 25:00, junior forward Ricardo Zecchi blasted a shot at Pius’s net that was deflected. The Knights earned a corner kick but were unable to find the back of the net. The Golden Lions continued to put Grady’s defense under pressure, and at 18:43 received a free kick after a hand ball by a Grady player. Hudson blocked the initial shot, but Aponte, who will play college soccer at Georgia Southern next year, was able to finish off of the rebound. Although the Knights pressed on to the final whistle, the game ended without any more scoring. The Golden Lions are now a perfect 14-0 with five games remaining in their regular season. Among these five games is No. 1 versus No. 2 showdown with also undefeated Woodward Academy at Woodward on April 20. 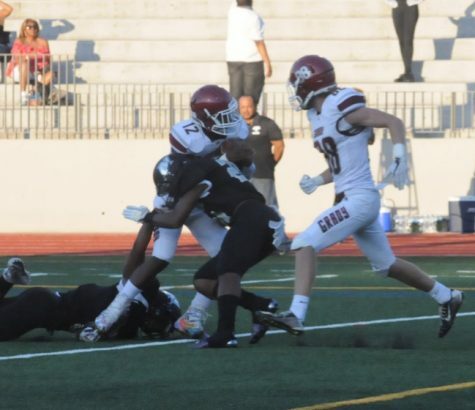 The Knights meanwhile hope to rebound when they face Stone Mountain in a region game at Grady Stadium next Thursday.